Backed by rich industry experience and market understanding, we are involved in offering a wide array of Wooden Computer Table to our valued patrons. 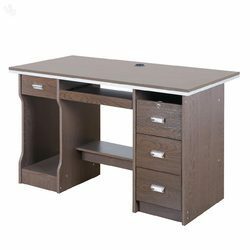 We manufacture and supply wooden computer table which is of very light weight. It also contains movable drawer to keep the keyboard on it. It is manufactured using high quality wood and other material. These are available in different shapes and designs as per the customers requirements. With the help of our expert team members, we are offering Wooden Computer Tables. High quality raw material and advanced techniques is widely employed by the experts in manufacturing these tables. In order to ensure the quality of this table, our team of experts test it on various parameters. The elegant designs of computer tables offered by us are the result of hard labor of our expert team leaders. These are made up of old/antique woods and commonly known as antique reclaimed wood furniture and thus are eco-friendly. Besides, we can also customize these products as per the drawings and specification detailed by the clients. Almira's of different sizes and designs. We also take orders on demand (customized as per the customer's requirement). 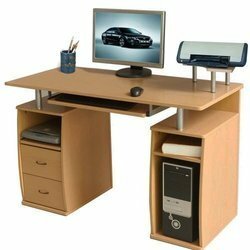 Sheesham wood computer table best suitable for computer work & office work.Custmize design & sizes available. Size:1500X900X750HFully made upon 18mm prelaminated Partical board with PVC beading.And three drawer pedestal, CPU provision with key board tray.